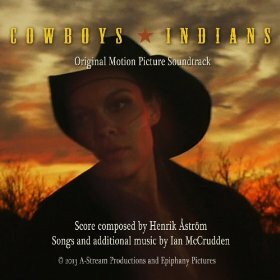 Cowboys and Indians is an independent film that benefits considerably through the presence of a set of compositions by Henrik Åstrom (who also created the score for 2011’s Jake and Jasper). While the visual component to the film is stellar and will draw viewers in, Åstrom’s 26 compositions for the film do more than highlight what is being shown on the screen. Rather, Åstrom’s work shines brilliantly on its own. From the introductory effort A Face From Long Ago to the closing strains of the one-two punch that is A New Beginning and Cowboys and Indians, Åstrom creates compositions that do much more than create further underlining for the action on the screen. The entirety of the Cowboys and Indians score can be enjoyed on its own; Åstrom weaves a thread that is constant throughout each of the compositions while establishing each track as unique. What is perhaps the most exciting about this soundtrack are those efforts – Oil and Water, Fireworks, It’s You – that begin and end before the two-minute mark. While few artists would be able to begin to express themselves in this space of time, Åstrom is able to create bold and confident compositions that contain considerable nuance. Throughout this score, Åstrom continues to include a rustic and outdoors feel. One will be able to envision the outdoors, grass waving in the wind, and the relationship between the cowboys and their methods of conveyance. While there are hints of influences that can be gleaned by listening to the soundtrack, Åstrom’s output is considerably different from the typical fare that is presence on scores and soundtracks. Taken together, Åstrom’s composition are able to make a solid film into something absolutely memorable. Individuals that wish to purchase a copy of the Cowboys and Indians score can purchase it from iTunes ( https://itunes.apple.com/us/album/id697836672?ign-mpt=uo%3D4 ), Amazon ( http://www.amazon.com/Cowboys-Indians-Original-Picture-Soundtrack/dp/B00FFJJNRM ), and Spotify (https://play.spotify.com/album/7kozMvkAG5e6iH2RVsjYn2 ). Åstrom’s website is located at http://www.henrikÅstrom.com/, and contains the latest news, samples of Åstrom’s compositions, and snippets from various news sources. Make sure to bookmark this domain (and add Åstrom on Twitter – https://twitter.com/Henrik_Åstrom ) to keep up to date about Åstrom’s upcoming scores for Mango Bajito and The Magic Ferret. For those with a limited about of time, visit one of the links above and make it a point to listen to Roof Over Our Heads, Angel Runs Into The Night, and A New Home (Cowboys And Indians).